Gaia is the European Space Agency’s mission to map the Milky Way, measuring positions, distances, velocities and spectra for 1 billion stars spread in our Galaxy and throughout the Local Group. Gaia began mapping the sky in August 2014 with its two telescopes, and billion-pixel CCD camera. Right now we are working hard to produce the first catalogue, which will be publically released to the whole world late this summer. A small team in Cambridge is also using the Gaia data to discover transients. Transients are objects that suddenly appear in the night sky and then fade away to nothing. If you stare at the sky with a large enough telescope, you would see that there is a population of these eruptive variable objects constantly coming and going. We made a movie of the history of Supernovae to illustrate that here: https://www.youtube.com/watch?v=lv8HtH-O3uQ. Examples of transients are Supernovae and Nova. A Supernova is one of the most dramatic events in the night sky, and results from the massive explosion of a star (see https://gaia.ac.uk/science/guest-stars-gaia/exploding-stars for more information). In late 2015 we began testing Gaia’s transient discovery potential. We found and published 273 “Alerts” for new transients we found with Gaia. We manage to classify 108 of these, including 74 Supernovae. The discoveries are published on our webpages at: https://gaia.ac.uk/selected-gaia-science-alerts. Our most exciting discovery was an outburst from a faint star, which we published as Gaia14aae. Thanks to community follow-up, including work from a network of amateur astronomers (the Center for Backyard Astrophysics), we identified Gaia14aae as a very rare kind of Cataclysmic Variable called an AM CVn system. 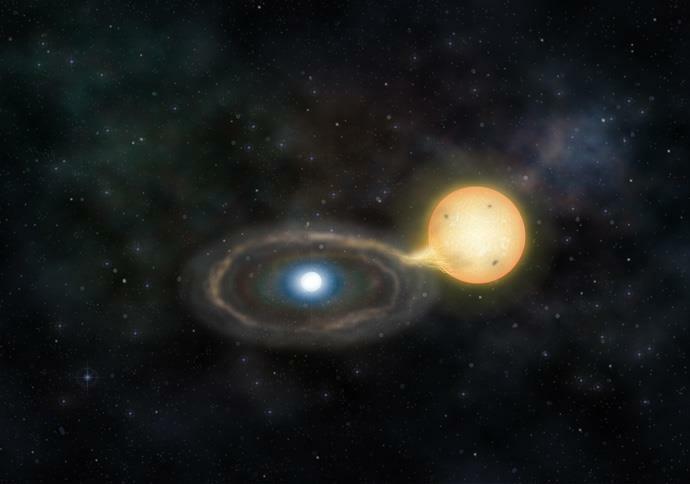 An AM CVn is a binary system where both stars are almost completely made of Helium, and the most massive star is a tiny white dwarf, about the size of the Earth, which is cannibalizing it’s companion. Our new system is particularly exciting because it is eclipsing – the larger donor star passes in front of the white dwarf blocking it out periodically every 50 minutes. We now know that Gaia is great for finding transients, but when we really get going, we will be swamped and unable to identify all of the alerts. Even in our small trial last year, we managed to identify less than half of them. In the future, we will need to appeal to a larger community for help. We are now setting up connections between Gaia Alerts and the Las Cumbres Observatory Global Telescope Network. This will enable schoolchildren to schedule the telescopes and take data to help us identify more of these fascinating transients. Watch our webpages !